Forget take-out. 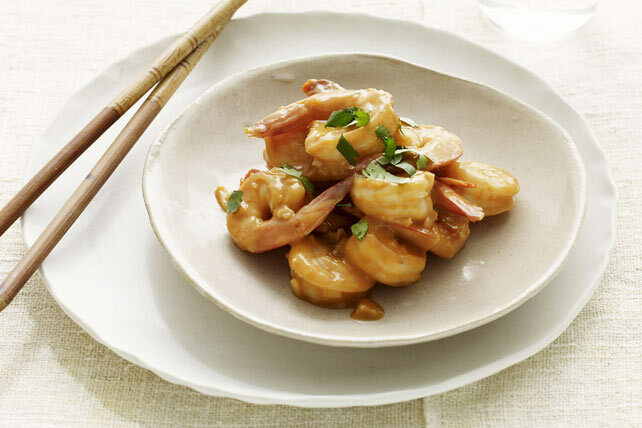 You won't believe how easy it is to make this stir-fried shrimp and peanut sauce recipe. Our Quick Thai Shrimp can be on the table in 10 minutes - how easy is that? Heat medium skillet on medium-high heat. Add peanut butter mixture; cook and stir 1 min. Stir in shrimp and garlic; cook 2 to 3 min. or until shrimp are done. Top with cilantro. Serve with hot cooked brown rice and green beans. Substitute 1 Tbsp. bottled minced garlic for the minced fresh garlic. Trying to add more seafood to your diet? Look no further. The tender shrimp in this easy-to-make seafood dish provides both flavouor and a good source of iron.